Can Anyone Identify This Viking Dragon Head Clock ? This clock came down through my father's side of the family. It belonged to my great-grandparents who both came over from Sweden in the late 19th or early 20th century. It is a cast iron black enamel case with gold ormolu mounts ending with Viking Dragon Heads. The 8 day spring wound brass movement is stamped with a small circle with a six pointed star inside and the words "New Haven" "Trademark" and "USA". It strikes the hour and the half hour. There is no writing on the dial. I believe everything is original. 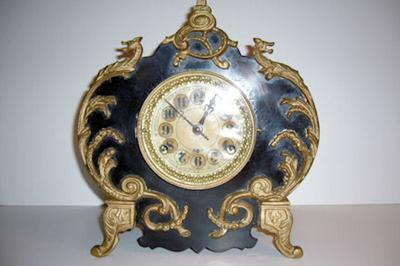 My questions are, was it made by the New Haven Clock Company or by someone else, what was the model name, what year was it made, (I realize it is from the "black" period of 1880-1900 but would like a closer time frame if possible),and what would it cost to replace for insurance purposes?